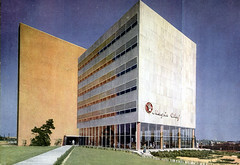 This is an image of Harris Armstrong's award winning design for the Magic Chef Building for the American Stove Company. The building is today largely unreconizable as a U-Haul storage facility. The original black and white photograph was 'colorized' for publication in The Architectural Forum magazine. Interesting building and your thoughts on it. I came to it via an ad in Architectural Forum for American Stove (actualy Thermopane windows) and am interested that Noguchi had been involved (not known to me). I need to look at the Noguchi bio but wonder at the connection with SOM. Nat Owings had a shrewd eye and this is just the kind of thing he would have picked out. Anyhow. Thank you.